Editor’s note: The following is a list of major cities and locations in Eramia, the country where our D&D campaign takes place. For more information, click here. Click the map to enlarge. The hub of Eramia, home to nearly all of the guilds on the continent — merchants, craftsmen, adventurers, scholars and many, many more. It’s also the primary place where technology is developing, thanks to the city’s sheer size, population and access to commerce. Lysidion is the melting pot of Eramia, with just about every walk of life represented in some way: races and religions, nobles and commoners, guild members and unaffiliated tradespeople. Home to the royal family and the majority of the nobles in the area. Waychester is a city steeped in tradition, particularly as it relates to the monarchy. The Whitehalls have been in power for the better part of five centuries, dating back to when civilizations first started collecting in the northern half of Eramia. Aebarrow Castle’s towering white walls loom over the Zenith District, which contains most of the other ruling houses. 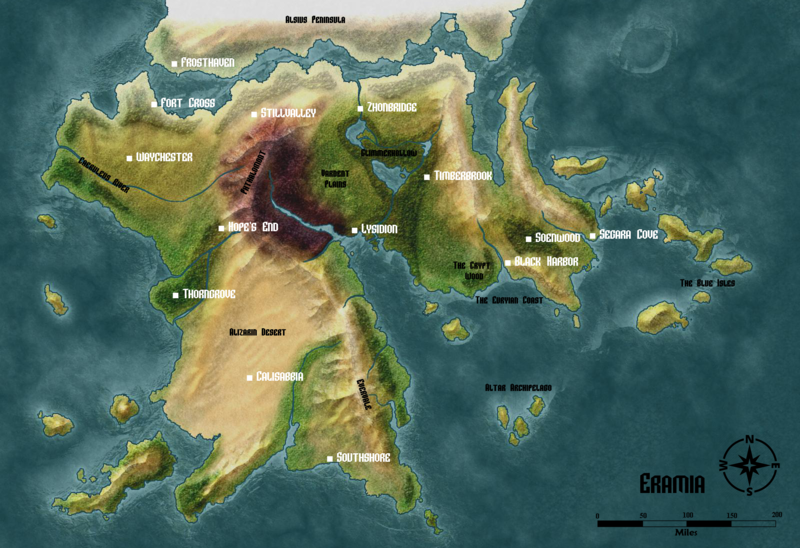 A towering, remote city tucked between the Euryian Coast, the Crypt Wood and the jagged, volcanic cliffs to the east. Black Harbor features a massive keep and a bustling fishing district. For generations, the city has been run by the Stormlords, who have a favorable reputation — but the location itself is another matter entirely. Between a bazaar where you can buy almost anything for the right price, an ever-present heavy fog and a tangible feeling of unease while inside the city’s walls, Black Harbor is known as a place you usually only visit if you have to. A thriving community that deals almost exclusively in sea trade and victuals, given its secluded location near a huge desert and a mountain range that’s said to be haunted. Southshore generally doesn’t receive much in the way of tourism, but the people who have made the trek and settled down give it rave reviews. The newest of Eramia’s major cities, having sprung up after the Great War in an area not too far from the main battlefield. Stillvalley most closely aligns with the Whitehalls’ intention to accommodate magic and technology at the same time. As such, there’s a tenuous relationship between its citizens inside the walls — and hundreds of thousands of gravestones outside the city that serve as a sprawling reminder of why that relationship is important. A blisteringly hot and dry city in the middle of the Alizarin Desert. Most people don’t travel there. Unsurprisingly, water is the key resource of the area, so much so that people are willing to kill and be killed for it. A respite for half-elves who feel neglected or attacked by the rest of society. Tucked in a somewhat remote location between rivers, desert and ocean, Thorngrove is an anachronistic city that has distanced itself from both the ruling nobles and the spread of technology. Eramia’s dominant military checkpoint, which answers directly to the crown prince. It also serves as the primary transit point between the mainland and Frosthaven. The fort is known to be nigh impenetrable, with four layers of sturdy walls and a skilled garrison tucked within them. Because of its proximity to Waychester, troops can be cycled over to protect the royals when necessary. A bustling city that serves as a final stop for anyone but adventurers and those who can afford to hire bodyguards. Hope’s End is so named because of its proximity to a harsh, unrelenting wasteland and because it actively pushes out any form of religion. Anyone intending to pass through to Calisabbia knows to be extremely well prepared. It also serves as the most accommodating entry point to the Phthalomont, a towering range of mountains nearby. A town bustling with logging and mining activity. The nearby forests and caves provide plenty of opportunity for those willing to put in the work. Timberbrook serves as a hub for any nearby commodities — any goods not produced in the immediate vicinity are acquired through trade instead, from places like Terreno Farm and Sheepstop Hollow. The only notable civilization in the harsh northern peninsula. Reaching the city requires official approval from the royal family — or finding a way to make the perilous journey on your own. Most of Frosthaven’s residents are people who decided to settle down once they went to the trouble of getting there in the first place.